Spacecraft travel either by air or on air-cushioned trailers. Crews record vibration during transport, and spacecraft packaging conforms to the specified environment. Launch-site operations include installing and validating the test equipment (EAGE), testing the spacecraft's performance, installing propulsion (AKM), loading propellant, mating the spacecraft to its launch vehicle, installing ordnance, and monitoring. Crews may also install flight batteries at the launch site. 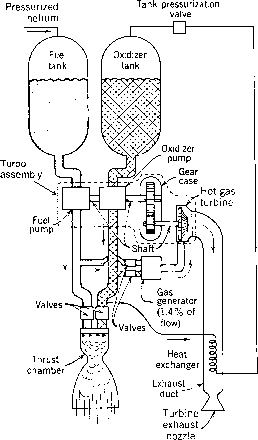 Figure 12-6 shows a typical flow of launch-site activities. Fig. 12-6. Typical Launch-Site Activities. The time required for launch site activity may vary from several months to several days. Normally, one of the launch-site test hangars houses the spacecraft test set for performance testing nearby. Crews install propulsion in an explosive ordnance area. They mate the launch vehicle and spacecraft, load propellant, and install ordnance on stand. Trained people conduct these hazardous tasks, using appropriate equipment and safeguards. Some spacecraft components can be replaced at the launch site and even on stand, but restricted access to the spacecraft usually makes replacement difficult Much time at the launch site goes simply to monitoring the spacecraft's state of health through hard-line connections or, dining some integrated tests, through RF links. Spacecraft commanding is strictly controlled. 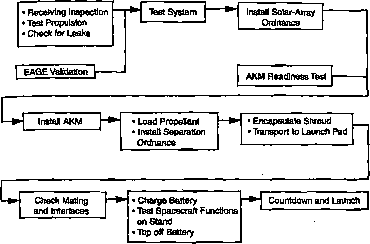 Launch procedures include configuring the spacecraft for launch and removing hard lines. General Dynamics Space Systems Division. 1988. Atlas II DoD User's Mission Planning Guide. San Diego, CA: General Dynamics Space Systems Division. Reeves, Emery I. 1979. FLTSATCOM Case Study in Spacecraft Design. AIAA Professional Study Series. TRW Report 26700-100-054-01. U.S. Air Force Rome Air Development Center. 1986. MIL Handbook 217E. Reliability Prediction of Electronic Equipment. Griffiss AFB, NY: U.S. Air Force Rome Air Development Center. U.S. Air Force Standardization Office. 1985. MIL Std 1521B. Technical Reviews and Audits for Systems, Equipments, and Computer Software. Hanscomb AFB, MA: U.S. Air Force Standardization Office. U.S. Army Armament Research Development and Engineering Center. 1978. MIL Std 480A. Configuration Control—Engineering Changes, Deviations, and Waivers. NJ: U.S. Army Armament Research Development and Engineering Center. -. 1985. MIL Q 9858A. Quality Program Requirements. Equipment, Munitions, and Computer Programs. -. 1985. MIL Std 490. Specification Practices. U.S. Army Missile Command. 1987. FED Std 209C. Federal Standard Clean Room and Workstation Requirements, Controlled Environment. Redstone Arsenal, AL: U.S. Army Missile Command.